And Will Smith is now the latest celebrity to roast the star on the extravagant present. The actor responded to the viral video which saw Kenny G privately serenade her amongst a sea of single stems of roses. 'Ye - I'm available next year!' posted Will on his Instagram Stories for his 27.8 million followers. The photo saw the star Photoshop in an image of himself playing the instrument among the roses. The image was taken from an episode of his show, The Prince Of Bel Air from back in season five in 1993. And Kim seemed to see the funny side, reposting the shot on her Instagram Stories. But Will isn't the first star to troll the reality TV personality and her rapper husband. Pal Chrissy Teigen also gave her two cents on Twitter on Friday. 'did Kenny have to stand there while the flowers were being set up? How did he get out? we need more info on kenny!!! Comedian James Corden also weighed in on the set-up, as he joked that everyone must now be feeling a little awkward about just buying their love's a box of chocolates. 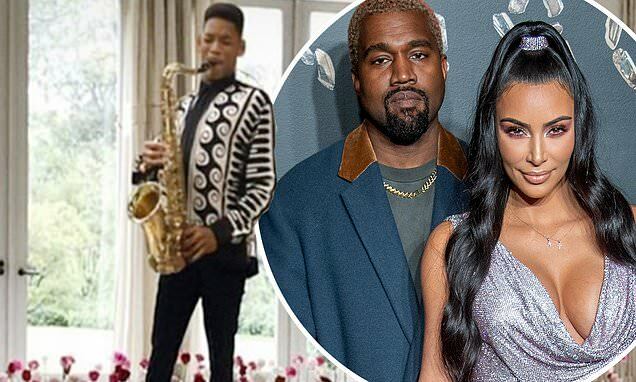 He said: 'Everybody has been talking about how Kanye West surprised his wife Kim by filling their living room with roses and bringing in the musician Kenny G.